Five hand made notelets with a Green or Gold on Green cover using handmade lokta paper (similar to the Gold Flowers on Green wrapping paper - Gold Wrapping Paper collection) with light green (or gold) on dark green and an insert of smooth natural lokta paper for writing. The handmade notelets are 105 mm by 75 mm in size (approximately 4 inches by 3 inches) and are supplied with un-gummed natural lokta envelopes 115 mm by 80 mm in size. 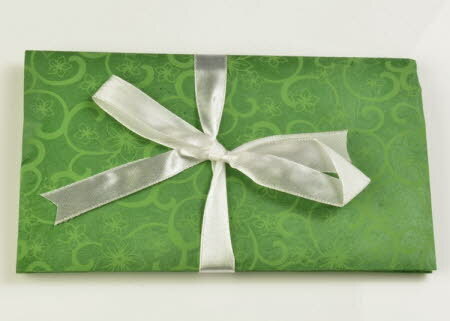 The notelets and envelopes are enclosed in a wallet of matching wrapping paper 150 mm by 90 mm in size (approximately 6 inches by 3.5 inches).